evon's world famous coastline and stunning scenery offers the perfect setting for even the most discerning golfer. Famous for its long hot sunny days, friendly relaxed atmosphere, and tranquil beauty, the county is home to some of the finest golf courses in England. Established in 1992, the Woolacombe & Mortehoe Golf Club in Devon has an exceptional headland 9 hole golf course with panoramic sea views, an excellent standard of presentation and an ideal location on the Golden Coast of the idyllic North Devon countryside. 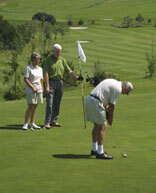 The golf course is a challenging 9 hole / 18 tee layout that will test your iron play and particularly your short game. With a fully licensed clubhouse, seated café area, golf shop, and award winning golf accommodation, we have everything you could want for to create the ideal golf break or golfing holiday in the UK.